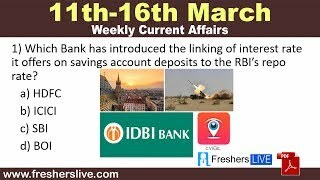 16 March 2019 Current Affairs: Prominent Lingayat pontiff and Basava Dharma Peetha President Maate Mahadevi passed away at the Manipal hospital in Bengaluru at the age of 74 years. She was born on 13th March 1946 in Sasalahatti, Chitradurga in Karnataka. She was an influential leader from the Lingayat community, took part in the protests held for separate religion and grant of minority status for Lingayats in Karnataka. In 1966, she received her Jangama initiation as an ascetic in the Lingayat order of wandering mendicants. Prominent Lingayat pontiff and Basava Dharma Peetha President Maate Mahadevi passed away at the Manipal hospital in Bengaluru at the age of 74 years.